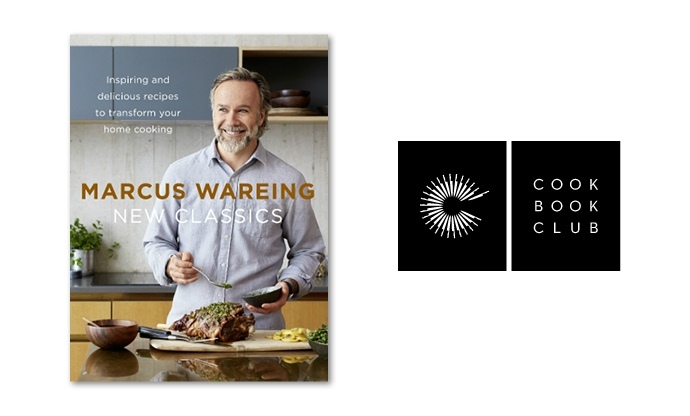 This month’s recipes from the Great British Chef’s Cook Book belong to Marcus Waring and come from his recently published cookery book New Classics. When I lived in London, I was fortunate to eat in some of his restaurants – divine! I have all of his previous cookery books which contain some of my “most cooked” recipes and, even though they are very much geared towards the home cook, they still contain incredible depth of flavours and textures. I frequently dip into them when I want to impress my French friends and prove that the English can cook. Of course, Marcus is probably now better known for his role on MasterChef: The Professionals. This is one of three recipes from New Classics and my beloved is certainly hoping (and praying) I’ll cook all three of them. But I’ve started with this vegan take on a tagine which includes an incredible homemade spice mix that gives real depth of and layers of flavour to the dish. 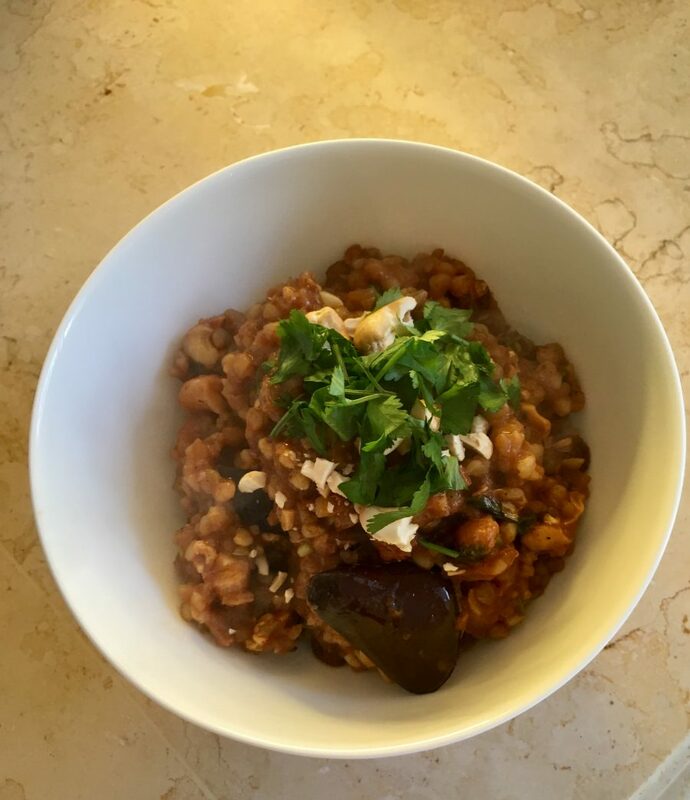 Marcus’s recipe uses freekeh, a type of ancient wheat grain with a nutty taste, which I’ve substituted with buckwheat because it’s what I had in the cupboard and it has a similarly satisfyingly chewy texture, plus it goes perfectly with the crunchy cashews and soft, yielding aubergine. It’s a great, healthy dish that ticks all the boxes in terms of flavour and texture and was even better reheated the following day! 1. Preheat the oven to 200°C/180°C fan/(400°F)/gas mark 6. 2. Put the cashew nuts on a roasting tray and bake for 5 minutes until golden. Remove, leave to cool, then chop roughly. Reduce the oven temperature to 160°C/140°C fan/(325°F)/gas mark 3. 3. Cook the buckwheat/freekeh/quinoa for half of the time stated on the packet instructions, then drain and leave to cool. 4. Heat 1 tbsp oil in a large casserole dish over medium heat. Add the onions, season with sea salt and pepper and sauté for about 10 minutes until they are soft but not coloured. Add the garlic and ginger for the last 3–4 minutes, then add the tomato purée, the passata or chopped tomatoes, stock, vinegar, molasses or treacle, raisins or currants and saffron to the casserole and remove from the heat. 5. Heat a dry large frying pan over high heat and, when hot, add the spices for the spice mix and stir them for 3–4 minutes until fragrant. 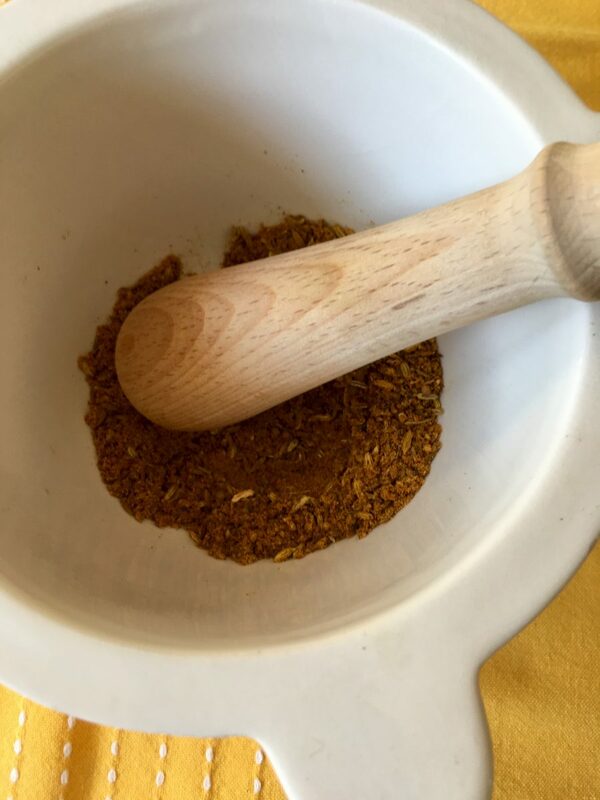 Transfer the spices to a mortar and crush with the pestle. Mix with the flour and table salt in a large plastic bag or bowl. 6. Add 1 tbsp oil to the frying pan and place back on the heat. 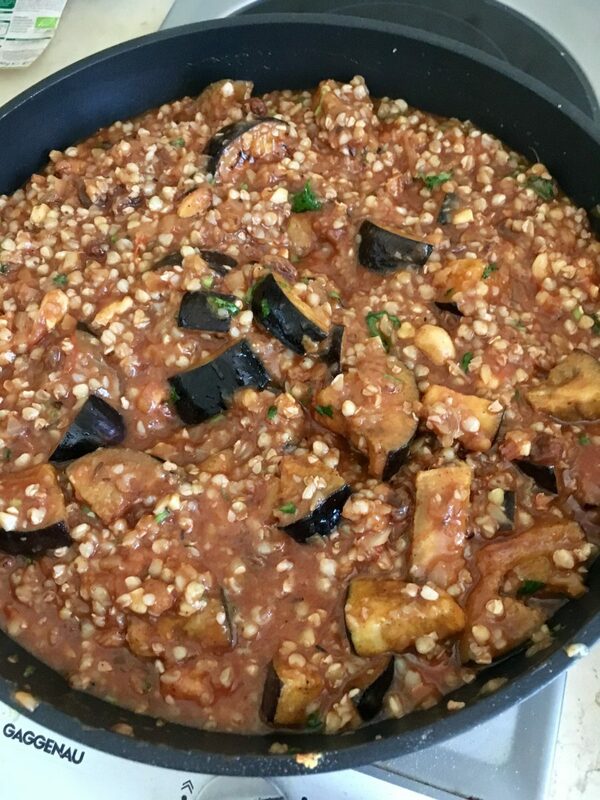 Season the diced aubergine generously with the spiced flour and fry it in the oil, in 3 batches, until golden, adding 1 tbsp oil to each subsequent batch. 7. Add half of the chopped coriander to the casserole, the part-cooked buckwheat/freekeh/quinoa and the spiced aubergine. Sprinkle with three-quarters of the chopped cashew nuts. 8. 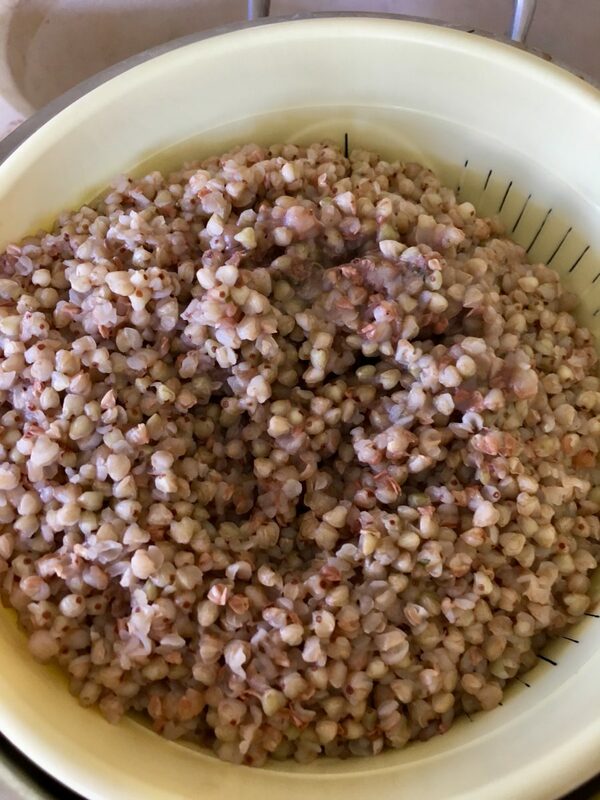 Bring to the boil, cover with a circle of greaseproof paper, put on the the lid and transfer to the oven for around an hour until the buckwheat/freekeh/quinoa is tender and the sauce thickened. Serve sprinkled with the remaining coriander and cashew nuts. 1. I’ve played a bit fast and loose with Marcus’s recipe yet it still tasted wonderful. 2. If you don’t have some of the ingredients in your cupboard think about what might be an appropriate substitution. That said, I think the aubergines are pretty central to the dish. However, I believe you could successfully substitute the cashew nuts with hazelnuts, almonds or walnuts. 3. 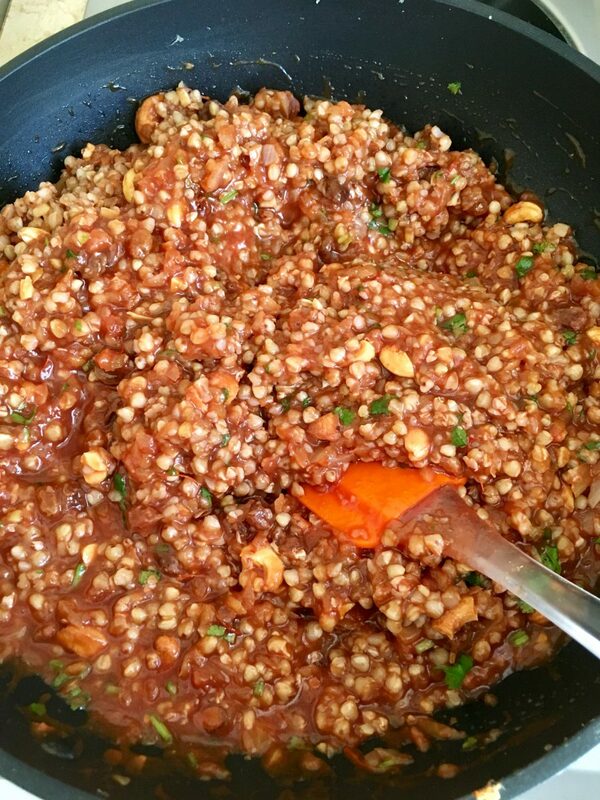 I used buckwheat instead of freekeh but equally you could use quinoa, farro or barley. You need something with a bit of bite. 4. I had all of the spices but if you don’t have cumin or coriander seeds, substitute with the ground spice. 5. I had a tin of black treacle but couldn’t be bothered to open a new tin for just a tsp so instead used pomegranate molasses. 6. Always use a timer when roasting nuts in the oven because it’s so easy to leave them for too long and burn them! I love aubergines and cashews. 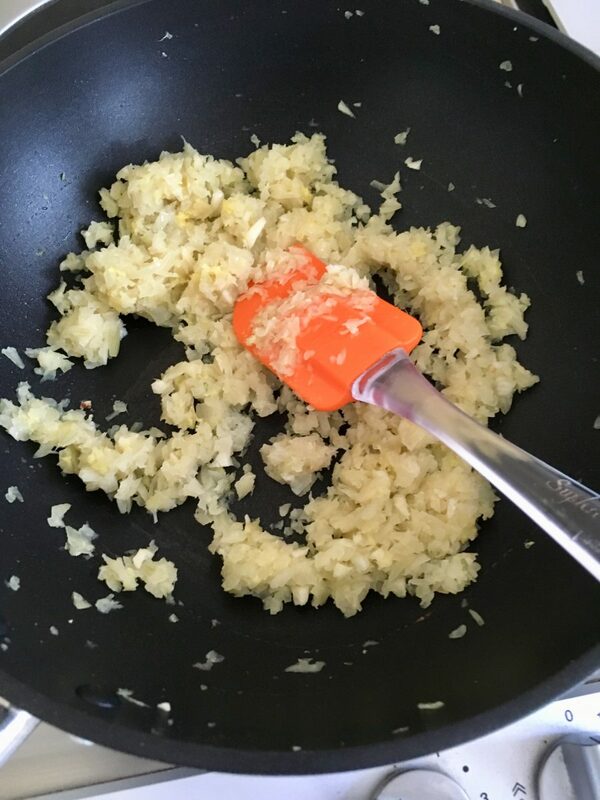 This is such a wonderful recipe thank you!